Rising Star 2 winner: After winning Sa Re Ga Ma Pa Lil Champs in 2009, Hemant Brijwasi surprised the audience with his soul-stirring performances in Rising Star 2. 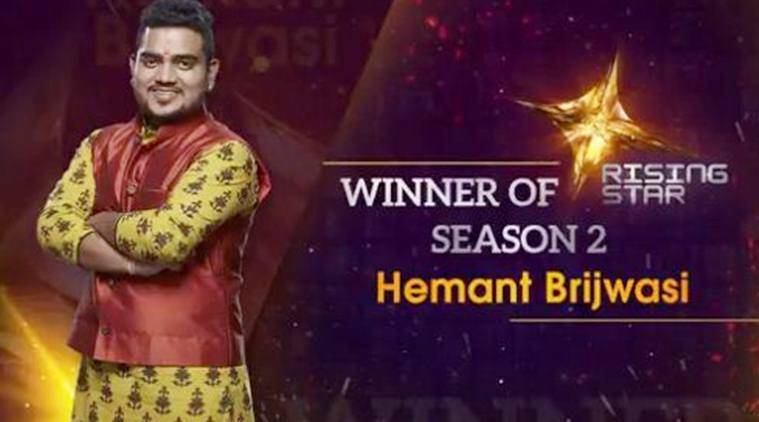 Rising Star 2 winner Hemant Brijwasi had earlier participated in India’s Got Talent. Hemant Brijwasi was on Sunday night announced as the winner of Colors’ singing reality show Rising Star 2. Hemant beat Rohanpreet Singh, Vishnumaya Ramesh and Zaid Ali to take home a shiny trophy and a lumsome prize money. The live voting show, judged by Monali Thakur, Shankar Mahadevan and Diljit Dosanjh, was much loved for its quality of talent this season. After winning Sa Re Ga Ma Pa Lil Champs in 2009, Hemant Brijwasi surprised the audience with his soul-stirring performances in Rising Star 2. The 20-year-old from Mathura had scored a whopping 94 percent votes during his live audition. Hemant had sung under Vishal Dadlani-Shekhar Ravjiani’s music direction for the animated series Arjun The Warrior Prince. Hemant had also participated in India’s Got Talent. For the finale act, he put up a soul-stirring act crooning “Alvida” from Life in a Metro, that got him 85 percent vote. The two-day finale episode saw six finalists making their way to the top but sadly Akhtar Brothers and Chetan Brijwasi got eliminated on Saturday night. Yesterday, the show also saw the presence of Alia Bhatt who launched Raazi’s first song on stage along with Shankar Mahadevan. Alia also crooned the contestants’ favourite songs. On the other hand, the three judges performed a special medley, making the finale night definitely a grand one. Hosted by Ravi Dubey, Rising Star launched its second season in January this year, with the theme ‘Uthao Soch Ki Deewar’, showcasing the struggles faced by the courageous and talented contestants who fight stereotypes and shatter prejudices to get on stage. Each contestant came across as a fighter, who proved that dreams and aspirations have no barriers. It was the first show on Indian television that got the audience to vote live for their favourites, and this season, the show managed to get more than 130 million people to vote on the show. Here’s wishing Hemant heartiest congratulations!